Tintin is neither a surname nor a first name, it is much more than that Tintin is a totally unique world, a myth or a saga. 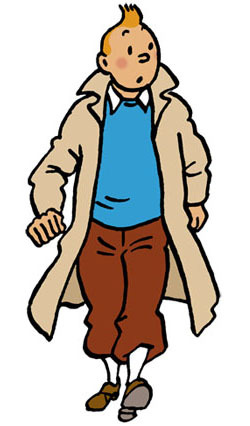 Tintin is created from Hergé's subconscious desire to be perfect, to be a hero. The hero who everyone between 7 and 77 years old wants to be, or become while reading the Adventures of Tintin. Tintin is created by his father Georges Remi, Hergé, the world renowned Belgian cartoonist. This spiritual heir is more than an adopted child! Hergé has stressed the fact that he raised Tintin, protected him, fed him just like a father would (Numa Sadoul, Tintin et moi, Casterman, p. 66) Over the years and in the course of the Adventures, Tintin surrounds himself with friends who became part his family so to speak. Among his friends, Snowy comes first. Admittedly he is a dog, but he is above all, the faithful friend of Tintin with a generous spirit. Secondly, Tchang appears in the family circle and becomes a lifelong friend of Tintin and almost a brother. Thirdly, Captain Haddock whose debut was to come a good ten years later is ready to sacrifice his own life for Tintin. Not forgetting all the others, Castafiore, Calculus, Thomson and Thompson who form Tintin's family circle. Without doubt, a top reporter. He went to Russia to cover a story for his newspaper and wrote his first reportage there. This is the only time the reader will see the young reporter preparing an article for his newspaper. We assume that Tintin kept the reader of his newspaper informed of his action-packed adventures. Tintin keeps travelling around the world and acts more like a detective always seeking the truth and fighting against injustice. Hergé was himself a reporter and his son has inherited a great deal of his father's passion. Tintin appears on each of the 24 covers. That makes sense! He was always accompanied by Snowy except on the final album cover, Tintin and Alph-Art. This is understandable, because this cover was not designed by Hergé. Although Captain Haddock plays an important role in the Adventures of Tintin, the latter is always in the limelight. His distinguishing feature is of course his little quiff! In the beginning, there was no such distinguishing feature. Most notably the first strips (the first 8 pages) show Tintin with smooth and combed hair. The famous hairstyle only appears when Tintin jumps into a car and races away. The sudden acceleration gives Tintin the distinctive quiff with which he is synonymous. The little tuft of hair will remain, and never droops. Tintin is free, and a very moral person with great integrity. He was considered by the Tibetan monks as a guileless person. These words reveal the true nature of the Tintin's personality. He is the hero that everyone wishes to become, or at least the friend that everyone would like to have. Tintin supports his friends all the way and pushes himself to the limit and fights to the last. I really feel sad that in the figure of Tintin the young adventurer Palle Huld from Kopenhagen is ignored. It is absolutely clear that Palle Huld was the example for Tintin. Palle Huld traveled as a 15 year old boy around the world in 44 days in 1928. It was worldwide big news in those days and Hergé must gave seen it. All the details with Palle Huld are correct, even that he was a boy-scout, of which Hergé was fond of. Palle Huld, his rond face, his cowlick!, his cloths, his traveling around the world, all is exact the same. Palle Huld IS Tintin. It is really sad all the official institutes ignore this fact. There should be a large portret of Palle Huld in the entrance hall of the Tintin Museum. TinTin is the best.Ilove him very much. Tintin is awesome, and is probably invincable. Tintin has amazing luck especially in "Tintin in America" where a train was about to hit him, but he was saved by an elderly woman stopping the train because a puma was chasing a deer! Same with "The Black Island" where a plane dropped a bag full of counterfeit money right on the crooks head. Also in "The Broken Ear" when a bolt of lightning went straight through the roof of the house right near the crooks. I wish i had that much luck!! !